McKinsey has a long history of advising the management of the world'ss largest corporations. A stint at McKinsey can open many doors, including the one to the CEO suite. 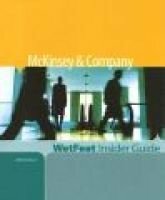 For aspiring McKinsey-ites, this WetFeet Insider Guide explores how the firm differs from its competitors; the firm'ss organization; its near-term hiring expectations; and what employees love most and like least about working there.